It is extremely important that we are able to diagnose someone with aspergillosis as quickly as possible, as the earlier treatment is begun, the better the outcome. People who have chronic forms of aspergillosis – such as Chronic Pulmonary Aspergillosis (CPA), Allergic Bronchopulmonary Aspergillosis (ABPA) and likely many cases of Severe Asthma with Fungal Sensitisation (SAFS) – are typically very difficult to diagnose. 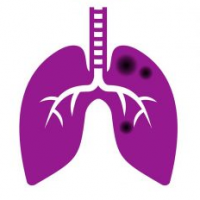 Centres such as the National Aspergillosis Centre (NAC) in Manchester are dedicated to detecting aspergillosis in patients who are, for example, struggling to manage asthma. Doctors throughout the UK send their patients to the NAC as there is no local expertise, a situation that is repeated in many countries throughout the world. Only the worst patients tend to be referred, many fewer than the predicted numbers of chronic aspergillosis cases in the UK. A simple test is badly needed to identify the ‘missing patients’ – a test that must be sensitive and simple to use. LD Bio, a company based in Lyon, France have developed a device (pictured) that may have far reaching consequences. Doctors can now simply put a drop of blood from the patient with suspected aspergillosis into the sample well at the top of the device, and wait for a few minutes for the result to develop. If the patient has aspergillosis two bands will appear, if not one band will appear. The National Aspergillosis Centre in Manchester, UK has tested the device (results to be presented at ECCMID 2019 in April 2019) and found it to be accurate, identifying 91% of cases of Chronic Pulmonary Aspergillosis in 30min. The manufacturers claim that this test is equally as useful in the detection of cases of Allergic Bronchopulmonary Aspergillosis (ABPA) and Aspergillus colonisation, suggesting that many more ‘missing’ patients could now be identified quickly and cheaply. If the same technology could be used to detect cases of SAFS, then even more patients could start to receive appropriate treatment sooner.